Welcome to Sudoku-Download. This site offers various Sudoku puzzles in different sizes and difficulties that you can download, print, and play. In addition, you will find here some tutorials that describe how to create and print Sudokus yourself. Most Sudoku puzzles are available in PDF format. Thus you will need the Adobe Acrobat Reader to view and print them. If this is not installed on your computer, you can download the Reader from Adobe free of charge. 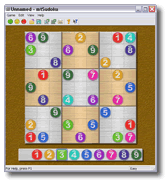 Sudoku-Download offers not only the usual Sudokus with 9x9 cells. If you like, you can also download puzzles of the size 4x4, 5x5, 6x6, 7x7, 8x8, 10x10, 12x12, 16x16, and 25x25. The 4x4 and 6x6 Sudokus are also available with symbols instead of numbers so that they are even well suited for children. With the 'Homepage' button, you can always return to this page. The 'Downloads' button will open the page for downloading 9x9 Sudokus. You can use the submenu on this page to open download pages for other Sudoku sizes. The 'Tutorials' page contains an introduction to the Sudoku rules and some tutorials on how to use the MaaTec Sudoku program to create and print puzzles in the formats that are offered on this website. The 'Program' button will open pages with further information about the MaaTec Sudoku application that was used to create the Sudoku puzzles on the download pages. Please note that all material on this website is copyright protected and may not be used for commercial purposes without permission.